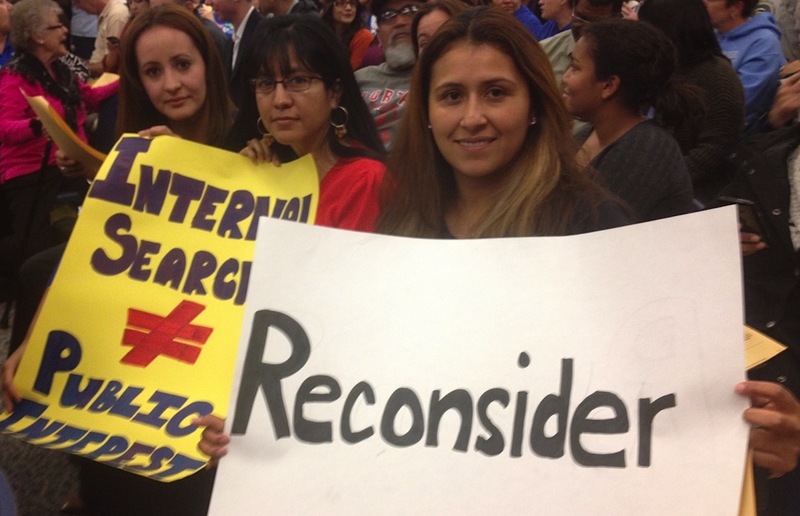 BACKGROUND: At a KHSD Board Meeting on Feb. 3, 2014, parents and community members expressed their concerns regarding the limitations of an internal search and asked the board to conduct an open search for a new superintendent. 1. On Feb 24, 2014 the board had a special meeting – with little advance notice, at 7:30 in the morning – as an opportunity for public comment to hear community members regarding the new superintendent position. The DHF Staff, CRLA and concerned parents again asked the board to consider open search and requested a time extension for the search. 2. On March 3, 2014, the board held another special meeting. The DHF presented nearly 700 signatures (in addition to the 200 collected online) of concerned Kern Community Members and asked the board to reconsider their refusal to conduct an open search. 3. On March 3, 2014 the KHSD officially announced that a new superintendent had been chosen. The district continues to face challenges in regards to discipline and lack of ethnic and cultural representation in the leadership and staff compared to the demographics of the students within the district. The community believes there is a strong impetus to change the status quo and bring in a superintendent with a new perspective and fresh leadership ideas.